Before I get too far, I have a couple of quick confessions to make. First off, I thought that Unavowed was being published by Ysbryd Games, since the demo was located in their booth this year at PAX West. I quickly found out that they were just being friendly neighbors, and that Unavowed is actually being published and developed by Wadjet Eye Games. Which brings me to my next confession – I have never played any of their titles. Not cause I have anything against them, just a lack of familiarity. This was likely also contributed to by the fact I only got into PC gaming in the past couple of years or so. 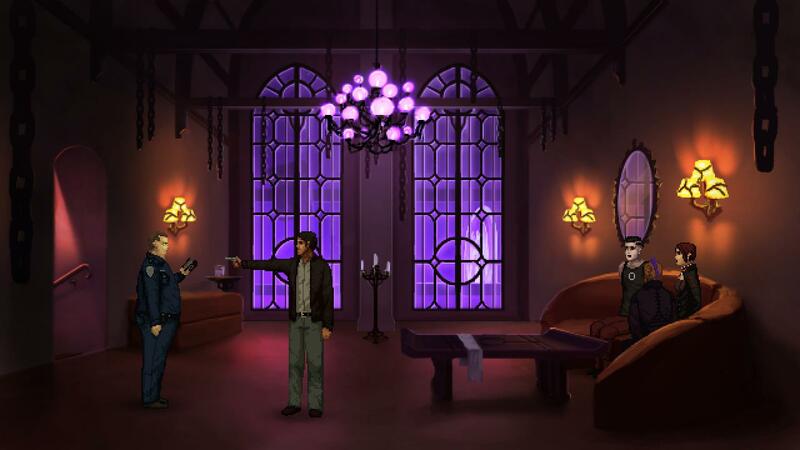 But now that all that is out of the way, what did I think of Unavowed at PAX West? 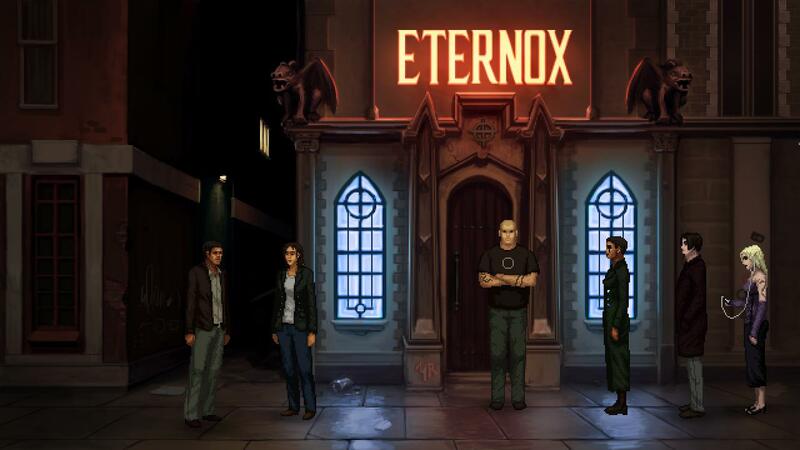 First off, I was drawn to demo this game because I heard it was like a Dresden Files story as an adventure game. Seeing as I’m a big fan of that fantasy series, I couldn’t say no. And they definitely got the hard boiled, bad luck detective aspect of Dresden down pat. The game starts with you watching a man being held down by a very strong woman and having commands yelled at you by another man. He starts off by asking you who you are, how you got there, pretty basic stuff except for the air of drama and suspense. Upon answering his questions, it quickly becomes clear something is up, as it seems he is not addressing you, but something that is puppeting your body. Cue a playable flashback, and you discover you are a detective who was investigating an odd robbery at Club Eternox. The detective who made the collar is not what you would call fit, yet every witness recalls him moving like a ninja and making short work of 3 younger criminals. You talk with the club owner, leave your partner to further question her, and head to talk with the heroic detective. Instantly something feels wrong, as none of the supposed culprits know why they are there, yet all three say the exact same thing when prompted about how they were captured. They all say the man moved like Bruce Lee. Your questions have to wait, however, as you see the detective take out a strange book and start chanting, his eyes glowing green. Before he can get much further, you point a gun at his head, but then he does something else and things get weird. Whatever power he was channeling jumps into your body, and suddenly you murder the three culprits and the detective. Not content to stop the bloodbath there, you wander downstairs and murder the club owner and your partner. The reason for this is you have been possessed by a demon! The flashback ends there, and it becomes clear your have been exorcised by the spirit by a group known as the Unavowed. For six months you were forced to go on a rampage, but now it’s up to you to find answers for yourself. The demo ended, for me at least, with the first interactive area. You are trapped by some monster who wants to consume you. You have to search in a dumpster to find tools with which to stop him. However, it turned out that the item I needed had disappeared in some glitch. So I kept trying without success to progress, until I was told something had gone wrong. However, that issue aside, I was pretty pleased with Unavowed. 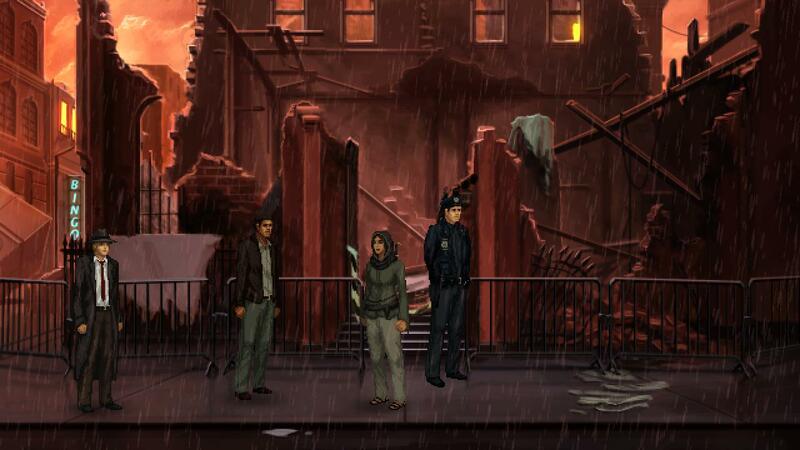 It had great pixelated art, ambient music and a killer premise. 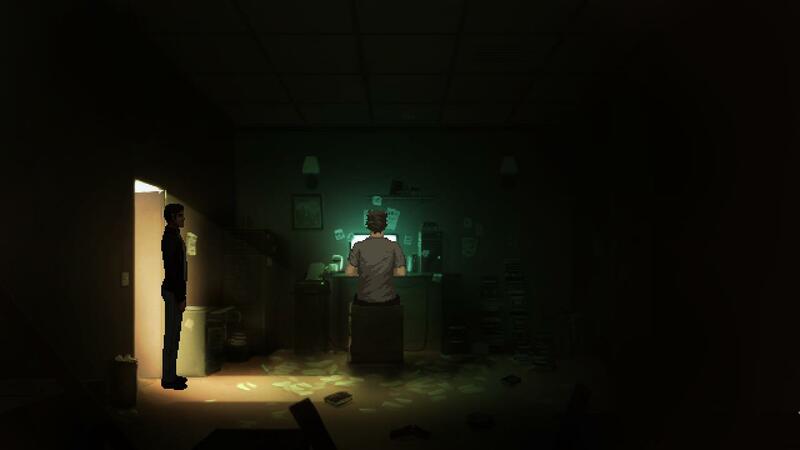 I look forward to seeing what Wadjet Eye Games does with it.